This study aimed to investigate how dark septate endophytes (DSE) from arid habitats affect host growth and their application to crops and medicinal plants in drought-prone soils. First, the osmotic-stress tolerance of Paraphoma sp., Embellisia chlamydospora, and Cladosporium oxysporum, isolated from Hedysarum scoparium, was tested using osmotically adjusted pure culture. Second, we examined the performance of host (H. scoparium) and non-host (Glycyrrhiza uralensis and Zea mays) plants inoculated with these fungi under mild (MD) and extreme drought (ED) conditions in a growth chamber. All the DSE showed high tolerance to osmotic stress in vitro and could colonise the roots of all the plants. For H. scoparium, DSE improved the root biomass and length depending on DSE species, with Paraphoma sp. and C. oxysporum exhibiting positive effects under all the drought treatments. For G. uralensis and Z. mays, DSE inoculation enhanced the root development of plants under MD condition and was dependent on the plant–fungus species. However, this positive effect was weakened under extreme drought stress. 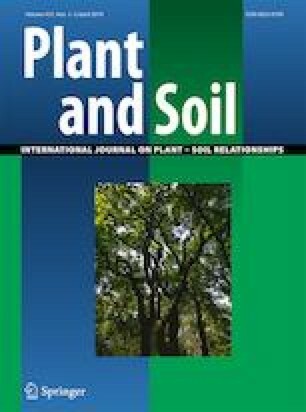 DSE isolated from H. scoparium enhanced the root growth of the host plant under drought conditions and may also be used to promote the cultivation of agricultural and medicinal plants. Responsible Editor: Felipe E. Albornoz. The online version of this article ( https://doi.org/10.1007/s11104-019-04057-2) contains supplementary material, which is available to authorized users. This study was financially supported by the National Natural Science Foundation of China (project no. 31470533, 31770561, 31800345). We greatly appreciate the support of Experimental Center of Desert Forestry, CAF for their invaluable assistance on this experiment.